This article is about the Ninjago character. For the Friends character, see Cole (Friends). 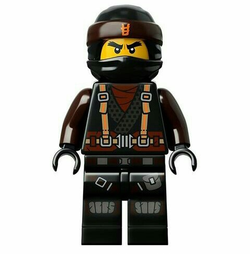 Cole also later known as Cod Kyungsoo is the black ninja of Earth Minifigure from the Ninjago theme. He is the Ninja team leader. Cole also had a former fear of dragons, however he conquered it and adopted the Earth Dragon, Rocky, becoming more attached to his dragon than the others. Cole appears in seven physical variations; as a trainee ninja, as a DX Ninja, as a Microfigure, as a ZX ninja, Kendo Ninja, an NRG ninja, and in a kimono. As a Normal Ninja, Cole has the classic ninja wrap first used in the Ninja theme from 1998 in Black. Cole's face print (which would normally be covered by the ninja wrap with the exception of his eyes and eyebrows), is made up of two black eyes with white pupils, a large frown, and two large, bushy eyebrows. His torso is a black ninja robe with black hands and no back-printing. The printing that is on the front, reveals black clothing under his robes. Also on the torso, is a little golden emblem, which is the Earth emblem in Ninjago. It also appears on Cole's spinner. Cole's legs in this variation are black with a Dark Stone Grey belt knot pattern printed on the hips and legs. As a DX ninja, Cole uses the same face and headgear as his first variation, but utilizes a special torso and legs combination. Cole's DX torso features printing on both the front and back; on the front, a golden depiction of the Earth Dragon. On the back, the name Cole is printed on in gold and the same golden emblem appears below it. On the legs, a different knot tied to his right. Also on the legs, is a continuation of the Earth Dragon design, here the tail is printed. Cole as a microfigure is similar to Cole as a normal ninja but in a smaller scale. As a ZX Ninja, his cowl has a silver visor which resembles the top of the earth dragon design. He still wears mostly black, but in ZX form he also wears silver shoulder armour which can hold two katanas in the back. Cole's face is the same as his previous versions. His torso also shows a printed design of some lightweight armour. And on the back is the golden earth dragon symbol, which is absent from the front. Cole's torso pattern continues onto his legs. As a Kendo Ninja, he has a mask with white grilles showing part of his face, Samurai armour and his old original black ninja suit. He has the classic ninja wrap first used in the Ninja theme from 1998 in Black. Cole's face print (which would normally be covered by the ninja wrap with the exception of his eyes and eyebrows), is made up of two black eyes with white pupils, a large frown, and two large, bushy eyebrows. His torso is a black ninja robe with black hands and no back-printing. The printing that is on the front, reveals black clothing under his robes. Also on the torso, is a little golden emblem, which is the Earth emblem in Ninjago. Cole's legs in this variation are black with a Dark Stone Grey belt knot pattern printed on the hips and legs. As an NRG Ninja, his head is black with the yellow eyes and streaks depicting his earth energy. His ninja hood has more red markings where the visor would be. His torso and legs have earth red streaking across them, representing his power of Earth. This form is mainly black, except for the streaks and eyes. 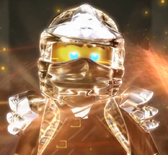 The gold Ninjago earth symbol also appears on the upper left of his torso. Kimono Cole has a black hood with a silver visor, he has a new torso printing all in black and silver. He has a black belt on, his arms are dark silver, he has black hands, the same face as Cole ZX and has silver marking on his torso. Cole acquires his Techno Robe from Cyrus Borg to combat the Nindroids. He uses a half-mask that exposes his hairpiece. His torso print is similar to Jay's Techno Robe. His robe is black and grey with earth detailing. In 2015 Cole gets two new robes: Jungle, which uses the ZX headpiece, but with a different printing on it, and a tournament outfit, which uses the half mask from the techno robes. Cole is the leader of the ninja team and is strongest in defence. He claimed to be afraid of no living creature, excluding dragons, but eventually overcame his fear. Cole's weapon of choices include the Staff of Dragons, the Scythe of Quakes, the Gold-Bladed Saw Staff, and the Golden Tri-Scythe. Preluding the storyline, Cole was found by Sensei Wu testing his strength, and was recruited to the Monastery to train along with Jay and Zane to become masters of Spinjitzu. In The Golden Weapon, the three ambushed Kai whom they mistook as an intruder, only to be revealed as Sensei's fourth student, the Ninja of Fire. 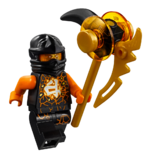 He then sent the newly-formed team of ninja on their quest to defeat Lord Garmadon's forces and reclaim the Golden Weapons of Spinjitzu, currently being hunted by Samukai and his forces, the Skulkin Army. Accompanied by Wu, the ninja travelled to the Caves of Despair and rescued the Scythe of Quakes, narrowly escaping the skeleton legions and the Earth Dragon protecting the Scythe. In King of Shadows, the ninja head to the Frozen Wastelands to salvage the Shurikens of Ice, and successfully retrieve the Nunchucks of Lightning from the Floating Ruins. 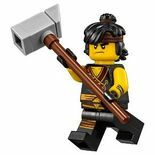 Unfortunately, Kai was lead into a trap at the Fire Temple by Garmadon, who made him think his kidnapped sister, Nya, was located within the temple. As Sensei Wu fought his brother, Cole, Jay and Zane were caught by Samukai and tied to a tree, and stole the remaining Golden Weapons. However, Wu sacrificed himself and travelled to the Underworld, along with the Sword of Fire, to prevent the weapons from uniting. Meanwhile, the others were chasing the Skull Truck and trying to retrieve the stolen weapons, only to fail when it travelled to the Underworld. In Weapons of Destiny, Kai and the others recruited the dragons whom protected the weapons and flew to the Underworld, where they defeated the Skulkin by performing the Tornado of Creation. They then found Samukai and Sensei Wu fighting within Garmadon's throne room, where Samukai was vaporized by the power of all four golden weapons. 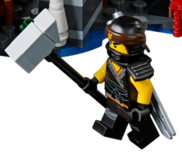 This caused a portal to open into an alternative, netherworldly dimension into which Garmadon escaped through, planning on growing strong enough to possess the four weapons upon his return. Having defeated Garmadon's plans, the team returns to the Surface World of Ninjago, where they are renounced as heroes throughout the land. 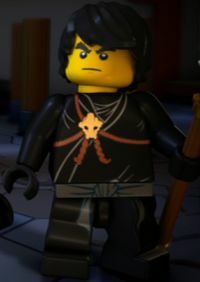 Cole also appears in the mini-episodes Flight of the Dragon Ninja, in which he takes part, and wins, in a race around Ninjago against his fellow ninja. He also appears briefly in The New Masters of Spinjitzu, but more prominently in An Underworldly Takeover, in which he questions Sensei about how Garmadon took control of the Underworld Skulkin army. In Rise of the Snakes, Cole follows the other ninjas to Jamonicai village after the report of Lord Garmadon's return. 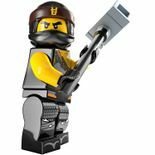 After discovering that it was only Lloyd Garmadon, Garmadons son, he and the others left him to the villagers. When they discover the scroll that prophesies of the Green Ninja, he tells them to ignore it. 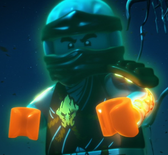 Nevertheless, he fights Zane in the dojo to determine the Green Ninja. After Sensei Wu broke up the fight, the ninjas go to Jamonicai village to see the report of the serpentine return. During the impending battle, Skales hypnotizes Cole. But before he can be fully entranced, Nya kicked Skales and he ran off. Afterwards, Skales reveals that he can now see what Cole sees, and Cole's eyes turn red when Skales does so. In Home, he and the other ninjas make fun of Zane for his odd behaviour, such as going into the bathroom when Cole is still in. Cole and the others make fun of him when he wears a pink apron, something they find funny. The next day, he follows Zane to the treehouse of Lloyd, not convinced a bird showed him. Once they arrive, they began to sever the ties to the treehouse. But before Cole could cut it, Skales fully entranced him and pitched him against the other ninjas as a distraction. After being beaten by Jay, he goes to destroy the treehouse, and the ninjas. But Sensei Wu and Nya fly in on the Fire Dragon and de-hypnotize him. After they return home to the ruined monastery, he unleashes the dragons and yells at Zane, and when Zane leaves he cooks a underground creature. After they find Zane and the new ship, he follows the other ninja and runs toward the boat. In The Royal Blacksmiths, Cole reveals that his father is a Royal Blacksmith because he recognized the Fang blade as part of a talent show trophy called the blade cup, which his father had won several times. He then reveals that his father believes that he is a student at a dance school. The ninjas then visit Cole's father. Cole knocks on his father's door at which he angrily tells him to ring the bell. Cole does and his father welcomes them in. After a series of comical events, his father believes that the ninjas are there to replace his quartet. while training for the talent show, Cole's father reveals that when Cole was seven he failed to complete a move called the triple tiger sash (a move so difficult no one had ever successfully completed). At the competition Cole discusses their plan to steal the cup. Cole's father overhears this and is shocked that his son was going to steal the prized trophy. Cole then reveals that he is a ninja. His dad goes away extremely disappointed. Cole then decides that they were not going to steal the trophy but win it. They change the name of their group from "The Royal Blacksmiths" to "Spin Harmony". They perform spinjitzu to the theme song. During the act Cole successfully performs the triple tiger sash. The ninjas get tens from the first two judges and 0 from Pythor (who had swallowed the real judge) but the real judge sticks his arm out and wrote a 1 next to the 0 making it a 10. All the ninjas celebrate, all that is except for Cole who doesn't think his father saw him. His dad reappears and is very proud of his son, not for dancing, but for fighting. Pythor then appears, and orders several Constrictai to drop studio equipment on Cole and his father. Cole then unlocks his true potential, by lifting the debris, saving his father. In All of Nothing, Cole goes with the ninja to the Serpentine Fortress for the Fangblades. There, he gets more into dancing and uses the Triple Tiger Sashe as a fighting move against Skalidor. During the fight, however, he is impassioned by Snake-like chains rushing to the Fangblade. Also, he plays checkers with Jay, and nicknames Kai's escape attempt. He is then last seen where he takes the Fangblades from Pythor P. Chumsworth. He appears again in Rise of the Great Devourer when he saves Sensei Wu from the lava in Torch Fire Mountain. He also reveals he hates metaphors. He is also seen driving his Tread Assault vehicle towards the Serpentine Truck, and uses it to blast Skales off of it. In Day of the Great Devourer, he gets gleeful seeing Rocky finally return. 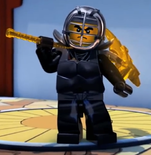 In the episode Child's Play, he and the other ninja are turned into kids by The Mega Weapon when trying to prevent Garmadon from bringing to life a Grundal fossil, much to Cole's dismay, as he had hated being a kid. Later, the ninjas attempt to use Illuma-Swords (which, oddly, resemble lightsabers) to defeat the Grundal, but are unsuccessful. Sensei Wu brings them a tea that turns forward the clock, turning him and the other ninjas older again. This also included Lloyd, who is now taller and has new hair. Lloyd then defeats the Grundal, and he and the other ninjas are saved. In Wrong Place, Wrong Time, Cole is helping to train Lloyd. He and the other ninja head to the city and arrive at night. While Fang-Suei works on the Fangpyre truck, Sensei Wu and the Ninja confront Lord Garmadon. Fang-Suei, Chokun, and Mezmo battle the heroes with their power tools. When the time portal opens, Sensei Wu tells the four Ninja to save the past and preserve the future. The four Ninja jump into the portal and land in a muddy rice field, not far from Four Weapons in the episode, Way of the Ninja. After Past Sensei Wu leaves the shop, the four Ninja tell him about their situation. Later, Cole hides so that he can kidnap Nya, along with Jay and Zane. Then Cole helps use the Scythe of Quakes to hurl the Mega Weapon into space. The Stone Army starts when the ninja are awoken by their alarm clock. Later, Cole helps to fight the Stone Warriors. One stone warrior keeps the ninja running away. They stop inside a large room and close the doors, and as the Stone Warrior begins to break it down Lloyd suddenly comes up with a plan and tells the Ninja to distract it, which Cole helps do. In The Day Ninjago Stood Still, Cole is helping to train Lloyd to fight without using his eyes. Later, in Ninjago City, the Ninja save a woman who was trapped by the collapsing street. Sensei Wu tells the Ninja to gather everyone to an evacuation point to be picked up by the Destiny's Bounty, which the only suitable evacuation point was the roof of the NTV office building. The citizens all head to the building while the Ninja hold off the Stone Warriors using the Ultra Sonic Raider and the Ultra Dragon. Cole continues to help hold off the Stone Army. With Zane gone, the team became fractured and eventually Cole quit being a ninja in favor of working as a lumber jack. Shortly after, he was visited by Lloyd who attempted to get the Master of Earth to return, and though Cole at first refused, he eventually met up with Lloyd, Jay, and Kai at Mr. Chen's Noodle House. Shortly after Cole objected to Lloyd's idea of adding a new ninja to replace Zane, Eyezor stormed in seeking trouble. The ninja soon found themselves united against the thugs as they battled them using food, until they retreated into an alleyway. The Ninja pursued, but all they found was a poster declaring Zane to be alive and an invitation to Master Chen's tournament of elements. He was the third ninja to reach his full potential. A running gag is Cole's obsession with cake. He mentions cake several times in episode 16, Double Trouble, as well as hoping Borg's gift is cake in "The Surge." Cole is voiced by Kirby Morrow, who also voices Anakin Skywalker in The Yoda Chronicles. Baxter Stockman from Teenage Mutant Ninja Turtles reuses his ZX shoulder pad armour. In the third season Nya starts having feelings for him, which only sparks a rivalry between him and Jay. His Techno blade is a chained weapon, while he normally has a staff-like weapon. 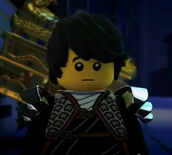 Cole is the ninja's most valuable player in the ninjago game, and is a good friend. He's strong, dependable, and is solid like a big, heavy rock. Cole pushes himself to the limit. He climbs the highest mountain, and then tunnels through it for fun. He is a force of nature that can't be stopped; unless of course, you're a dragon, a big, scary dragon. Cole is stronger than ever…having learned spinjitzu and conquered his fear of dragons, he and his mighty Earth Dragon are as tough as a mountain. Together they knock down the skullkins like an earthquake. Where Cole goes, the ninja follow, because Cole is their team leader and a good friend. He's strong, dependable, and solid like a big, heavy rock. As the Ninja team's leader, Cole inspires confidence in his team and is the go-to guy for getting things done. He might not be showy like some other Ninja we could name, but he's strong and dependable. Oh, and he hates Snakes. "The New Masters of Spinjitzu"
LEGO Club Magazine Issue 1 2011 - Front cover and Lessons of the Dojo!